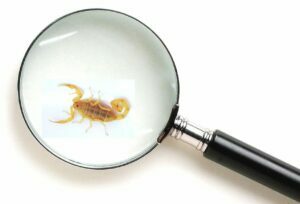 Scorpions are animals classified as arthropods. Are scorpion insects? Most people think of Scorpions as insects, but they’re actually Arthropods. Most pest control targets are insects, but there are several arthropod pests in the Phoenix Valley that require Pest Control services to eliminate including SCORPIONS. Arthropods are actually a group ANIMALS with jointed appendages. “Artho” means joints or segments, and “poda” means foot or appendage. Besides jointed appendages, Arthropods have several characteristics that set them apart including: exoskeletons that are commonly MOLT or shed, a segmented body, a body cavity containing blood, OPEN circulatory systems, and they breath through GILLS or external openings with small tubes. Other Arthropods include: CRABS, LOBSTERS, SHRIMP, Centipedes, Millipedes, Ticks, Termites, Ants, ROACHES, and Spiders! Join 1,000′s of HAPPY CUSTOMERS living SCORPION & pest FREE with the Scorpion Control experts at Responsible Pest Control! There are several classes of Arthropods. SCORPIONS are Arthropods that require pest control in the Class Arachnida. They do NOT have antennae, they have FOUR pair of legs and TWO main body regions: the cephalothoraz and the abdomen.